Many people assume once they hit 35 or 40 or 50 or 60—or whatever made up number they decided in their head makes them “old”—it’s too late to improve their health and fitness. They assume they’re over the hill, or past their prime, and that their youthful strength, stamina, flexibility is gone, never to be reclaimed. This has never been the case for the Lovely Laila Benkrima. When this French Goddess arrived at MadLab four years ago, I remember thinking, “Damn, she’s the fittest 50-year-old I’ve ever come across!” Before coming to us, she had been spending her time running 30 minutes each day, worked out at Spartacus on Commercial Drive on the regular and also did yoga. Needless to say, she wasn’t a decrepit 50-year-old when she started training with me. But at the same time, she was bored. She had been doing the same thing for years and lived a lonely existence at her former antisocial gym. I remember her telling me she she was bored of her current routine, that her fitness was on an extended plateau, and that she needed a change. I knew right away this gem was going to blend well in our community. To say she has done that is an understatement. 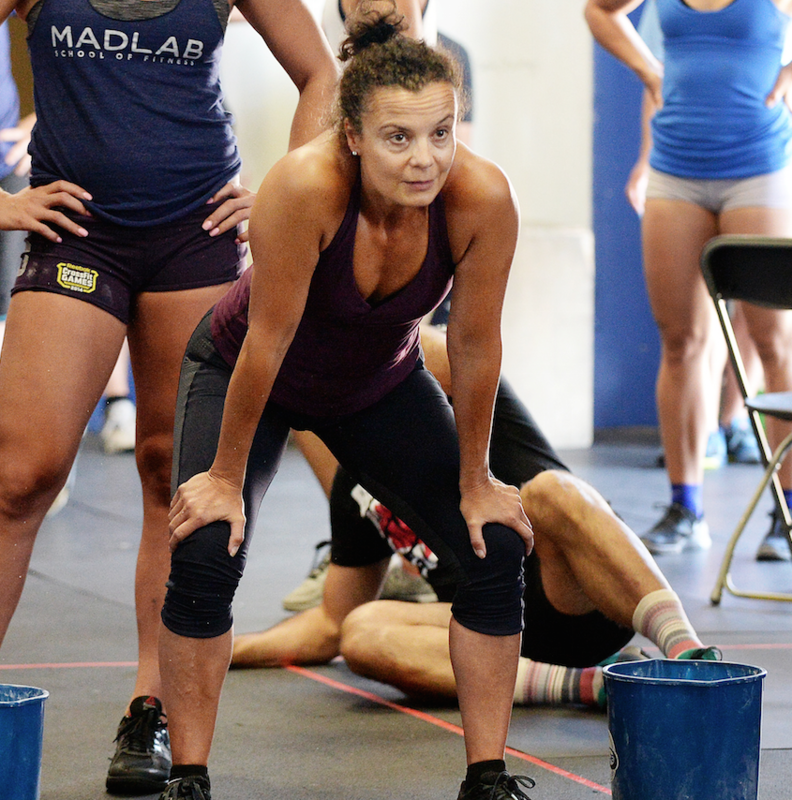 She has become a staple of the 6 a.m. crew, and can often be found challenging people 20 years younger than her to even attempt to keep up with her. Last year, she competed at Nutts Cup and more than held her own. All her hard work has paid off. Four years since starting with us, Laila’s even fitter than she was at 50—proving day-after-day that you can become not only more fit, but also stronger, in your 50s and beyond. She has no intention of stopping any time soon, she said. Today, Laila, who is a pretty slight woman, can deadlift 200 lb. Not only that, but she can also do six strict pull-ups. “My goal is 10 this year,” she said. Also, nobody’s burpees are as swift and graceful as this woman’s. As her coach, I have also noticed the way she moves has improved tremendously in recent years, mostly due to improved functional flexibility and mobility that allows her to get into better positions. For Laila, though, it’s not just about the gains she has made physically. “Exercise not only benefits the body but also the mind. It reduces depressions and anxiety and will add many good years to your life,” is the message she wants others her age to hear from her story. Not only that, it keeps you feeling and looking younger, which she isn’t too proud to admit is important for living a great life. “What motivates me the most is my health, but also, not to be vain, the way I look,” she admitted. It’s safe to say this woman looks as good as ever, and is ready to continue to tackle life at an when many others start to give up. We’re so lucky to have you with us Laila. Cheers to many more years of improvement.